Dubai, UAE, April 23, 2018: Everything begins with the sound of Earl Bostic… True to its jazz references, the studio combines the elegance of the 50s with the spontaneity of the libertarian American youth. Aloysious Parker, the protagonist from Jim Jarmush’s Permanent Vacation, dances throughout the collection. The fashion house plays with proportions and composes freely with references from the past. A white stitched ocher suede zip jacket is paired with a pair of summer houndstooth trousers sharply cut at ankle length. The timeless leather jacket has an undersized fit over a mesh t-shirt. The softness of the tropical printed bowling shirts contrasts with the wide-cut jeans. The style displays a refined casualness. The silhouette is fitted without ever being constrained. 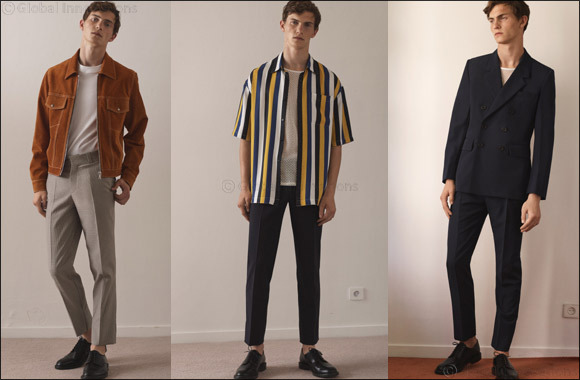 For a man whose only label is one of independence, the studio strongly refers to the Beat Generation. We distinguish the look of the intellectuals from the 50s, lost in Mediterranean wanderings. When playing around with the archetypes of the masculine wardrobe, the bankers’ striped shirts are impertinently revisited. The timeless navy double-breasted suit is worn over an off-white mesh net. A single-breasted linen suit is brightened by an ethnic mustard yellow. Entirely handmade leather derbies strengthen the look. The studio displays its taste for elegance and cultivates tradition with a cheerful casualness. The options are endless, and the appearance is personal. As if to better adhere to the architectures of cities of concrete and steel, military notes resonate onto the wardrobe and inscribe vintage aesthetics in an urban dimension. A shirt jacket inspired by the German army is elaborated in off-white cotton and combined with a white straight edge cut pair of jeans. A moss stitch shirt is displayed in a brown khaki. The iconic oversized mackintosh reveals military details. The traditional pea jacket is offered in summer wool and the fisherman’s smock is worn with denim. The lace up military boots are available in brown suede with a generous sole. Sandro Man composes a complete wardrobe for a liberated man, free to trace his own path, and display his own style.